Thomas Coates, York House, Kensington; (+) Christie's, London, 19 January 1884, as de Witte (£5 10s to Garcia). Mrs Younger [Anonymous sale]; Christie's, London, 21 December 1923, lot 35, as Job Adriaensz. Berckheyde (273 guineas to Duits). with Jacques Goudstikker, Amsterdam, 1924. Looted by the Nazi authorities, July 1940. Recovered by the Allies, 1945.
in the custody of the Dutch Government. Restituted in February 2006 to the heir of Jacques Goudstikker. J.S. 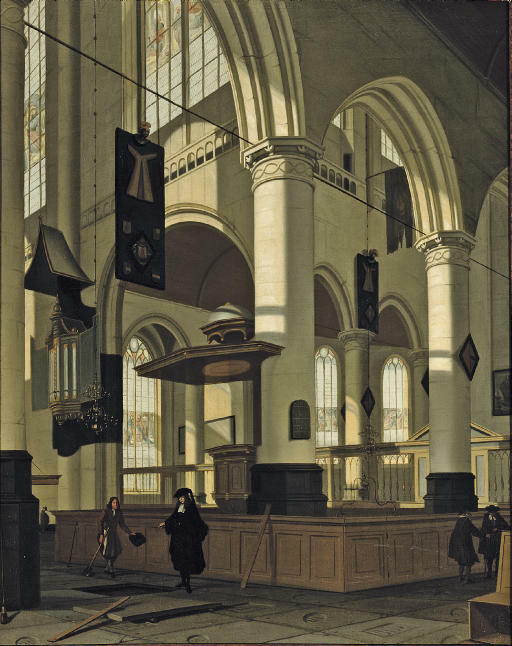 Gudlaugsson, 'Een kerk interieur van Hendrick van Streeck', in Kunsthistorische Mededelingen I, 1946, pp. 50-1, fig. 2. I. Manke, Emanuel de Witte 1617-1692, Amsterdam, 1963, p. 146, no. 341. C. Wright, Paintings in Dutch Museums. An Index of Oil Paintings in Public Collections in The Netherlands by Artists born before 1870, London, 1980, p. 503, as Emanuel de Witte?. Old Master Paintings: An illustrated summary catalogue, Rijksdienst Beeldende Kunst (The Netherlandish Office for the Fine Arts), The Hague, 1992, p. 321, no. 2858, illustrated, as Emanuel de Witte. B. Schwarz, Hitlers Museum. Die Fotoalben Gemäldegalerie Linz: Dokumente zum 'Führermuseum', Vienna/Cologne/Weimar, 2004, p. 115, p. 245, IV/41a, illustrated, as Emanuel de Witte. The Hague, Schilderkundig Genootschap Pulchri Studio, Catalogue de la Collection Goudstikker d'Amsterdam, November 1924, no. 131, illustrated, as Emanuel de Witte. The Hague, Schilderkundig Genootschap Pulchri Studio, Catalogue Collection Goudstikker d'Amsterdam, 13 March-4 April 1926, no. 189, as Emanuel de Witte. Utrecht, Museum Catharijneconvent, on loan.